And if you’ve never had zucchini bread, let me assure you — it does NOT taste like zucchini! It basically tastes like cinnamon — and whatever other flavors you add to it. 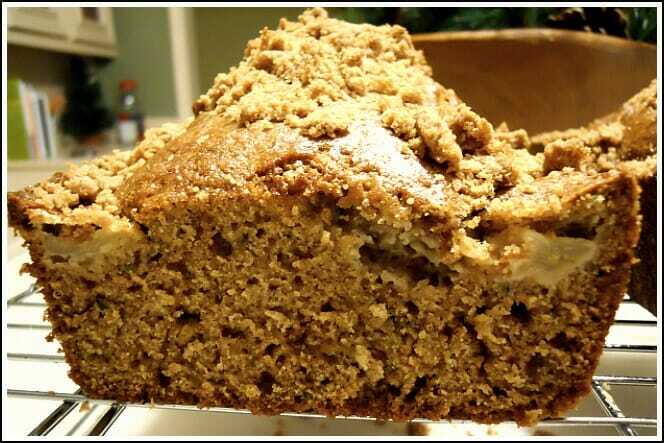 So, you can image how delicious Apple Zucchini Bread tastes, since it’s basically Apple Cinnamon Bread…YUM! 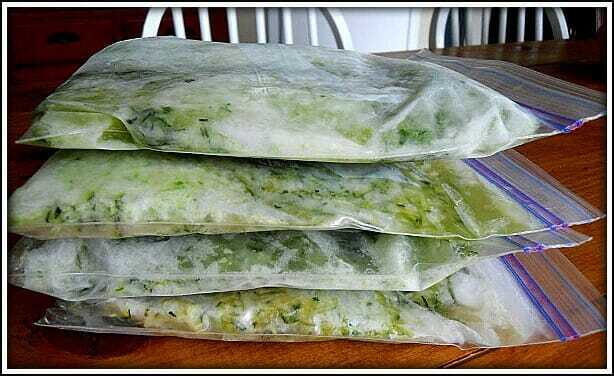 So when it’s time to make zucchini bread, zucchini brownies, or any other delicious zucchini recipe, I simply defrost one bag and I’m ready to go. Feel free to alter the spices and seasonings to fit your family’s taste buds! Sometimes I use nutmeg, allspice, cloves, apple pie spice, etc. Also, when I substitute apple sauce for the oil, I usually add about 1 T. extra apple sauce to prevent the bread from drying out. This is one of my all-time favorite breads and it’s so simple to make! Plus, is there anything better on a FREEZING cold winter day than to walk in the kitchen to the smell of deliciously warm Apple “Cinnamon” Bread with melted butter??? Ok, I’m off to the kitchen for a snack! enjoy all your zucchini! we’re just finishing up a loaf of the apple zucchini bread! can you use any kind of apple? I love your recipes. Am not too fond of eggs in baked goods. Is it alright if i substitute flax seed for eggs in this apple-zucchini bread? Meanwhile, i shall try your zucchini brownie. Honestly, I don’t think Flax Seed would be a good substitute — it just doesn’t seem comparable to eggs in any way. however, you could always give it a try and see how they turn out! I thought this recipe sounded great when I first read it. I haven’t had the greatest apples this fall. I have just enough zucchini in my freezer to make it, but I’m wondering if my ‘not so crispy’ golden apples would be okay in this bread. I just don’t want to ruin it or waist my precious time! Have you ever baked with apples that weren’t very crispy or kind of old? Let me know…thanks! 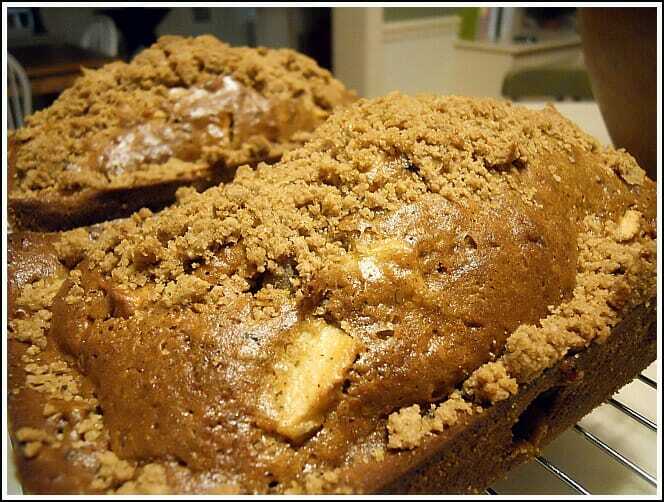 This would be a perfect recipe for less-than-stellar apples… they get mushy when baked anyway! Another idea if you have lots of apples would be to make applesauce. Just peal and core them, put them in a large pan with about a 1/8 – 1/4c. of water (just so they dont’ burn) and cook them about 20 minutes, or until very soft. Mash them up and add a little sugar or cinnamon as desired. YUM!! I love zucchini bread too! I always make a bunch of it when the zukes go on sale at the market! It’s so moist and tender. I’m going to try this recipe because hubby hates veggies and I bet he won’t even know they’re in there. This bread looks moist and delicious! It IS moist and delicious — and I guarantee your hubby will never taste the zucchini! I wish I had all that frozen zucchini! Looks delicious!